Red Velvet Cake recipe with Cream Cheese Frosting makes three layers of delicious old fashioned cake from scratch, using a minimum amount of food coloring. There are numerous stories circulating, explaining the origin of this famous cake. I believe the story about it originating from the owner of the John A Adams Extract Company. The company started selling flavoring extracts, spices, and food coloring in 1888. The story goes that the company wasn't moving it's products too well so Mr. Adams came up with this recipe, using an entire bottle of food coloring. 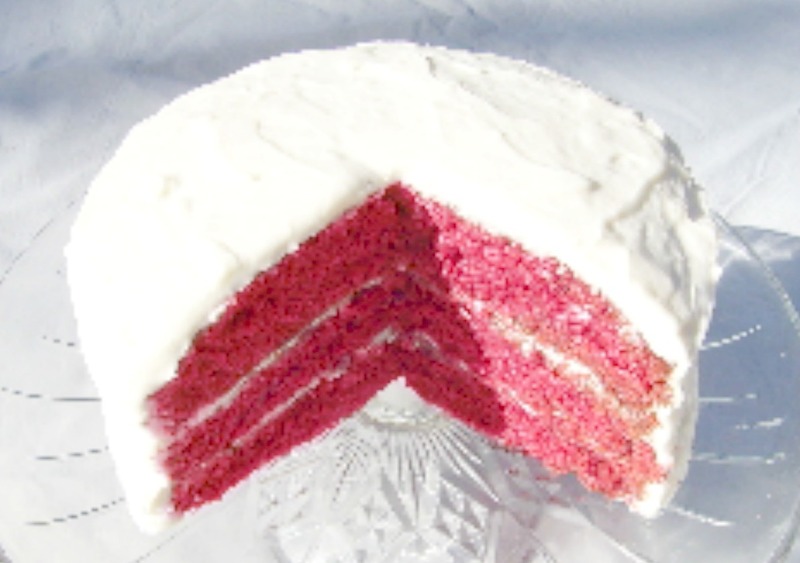 Subsequently, he advertised his business with pictures of this "bright red cake" and a recipe for Red Velvet Cake containing butter flavoring, vanilla extract, and red food coloring, ingredients he sold. Sales soared according to the legend. Good news! A Red Velvet Cake does not need two, three, or more tablespoons of food coloring that some recipes call for, to attain that brilliant red color! Sift together sifted flour, sugar, baking soda, and salt into a small bowl. Set aside. In a large mixing bowl add vegetable oil, buttermilk, eggs, vanilla extract, and vinegar. Mix on medium speed 1 minute. In a small glass container stir together cocoa powder and red food coloring until smooth. Add to mixture to batter and beat 1 minute more. Fold in flour mixture and continue mixing for 1 more minute on medium speed. Scrape down sides of bowl and bottom to get any flour clinging to them. Beat 30 seconds more. Pour into three 8" cake baking pans that have been greased, lined with waxed paper or parchment paper, greased again and lightly floured. Bake in a preheated oven 350F. for 20-25 minutes just until tested done. It is important that you do not overcook these delicate cake layers so they are kept moist and tender. Remove from oven and let set 5-10 minutes. Turn out onto a wire rack covered with a linen or other non-terry cloth to cool. Take butter and cream cheese out of refrigerator and let reach room temperature. Takes less than an hour. Cream butter and cream cheese together in a mixing bowl on high speed. Beat in vanilla extract. Gradually add sugar, a little at a time while beating on low speed, until all is incorporated. Turn mixer to high speed and beat 2-3 minutes until light and creamy enough to spread on your thoroughly cooled cake. *You probably won't need the cream or milk. However, some butters contain a higher percentage of fat than others, affecting the consistency of your frosting. If your frosting becomes too thick to spread easily, add a little of the cream or mlk until it reaches the desired spreading consistency. Should your frosting become too thin for you (could happen if your butter becomes too warm before you start beating it), add a little additional powdered sugar to thicken it up. The goal of this frosting is to get it to as soft a butter cream texture as possible, without it running off down the sides of the cake. Yummy! Store cake in a covered cake pan. This cake seems to have improved texture and taste the next day making it an excellent "make ahead" cake!